You can schedule your appointment online or by telephone. If you ring us, our receptionist will discuss your needs with you and book you with the appropriate dentists. 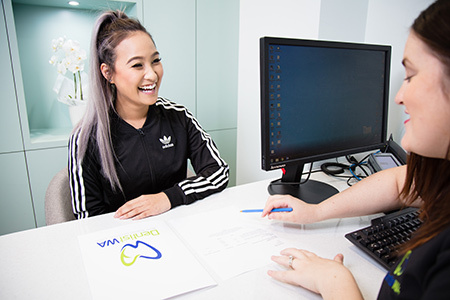 If you choose to book through our online portal, you can read about each of our dentists and decide who you would prefer to see. Once you’ve scheduled your appointment, you’ll then be sent a confirmation email. Our team will ring you within a day to welcome you, describe your treatment and get your health fund information from you. When you arrive, we’ll get your information on an iPad, as we are a paperless practice. If there is a brief wait time, you can watch television or browse magazines in the waiting area or help yourself to water, coffee or tea. We’ll begin your appointment with a consultation. You’ll sit down with your dentist to discuss what’s brought you in and what you’d like to accomplish. If x-rays are needed, we’ll get those images taken. The dentist will then complete the necessary procedure. You can plan on being here for about 50 minutes for your first appointment. If multiple appointments are necessary, you’ll meet with our treatment coordinator to go over your options, costs and payment plans. We’ll then book you for your visits, or can send a link so that you can do so online. We accept health funds and are a preferred provider for Bupa, CBHS, HBF, HCF and nib. Book your time with us today!